The Cable Stitch creates lines or boundaries on your fabric. Here you see it used for the stems in these tall flowers. In my version of the Cable Stitch you get a pointy look. I like pointy. Here’s how to make the Cable Stitch: Imagine there is a line drawn on your fabric that you are going to follow. Work from left to right. Bring the needle up at point A. Insert the needle tip at point B about 1/4″ from point A. Bring the needle tip up about half way back to A at point C. Point C is just above the stitch line. Place thread going into B below the needle as you draw the thread through the fabric. Insert the needle tip at point D about 1/8″ from B. 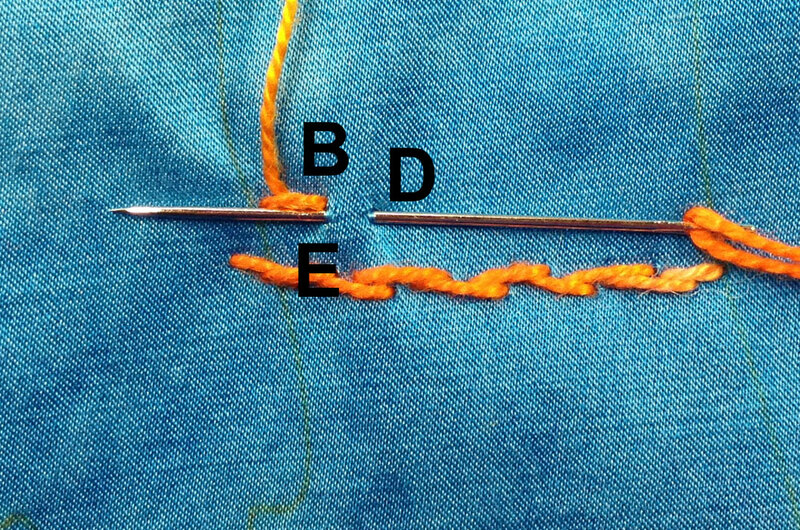 Bring the needle tip up just below point B at point E. Point E is just below the stitch line. 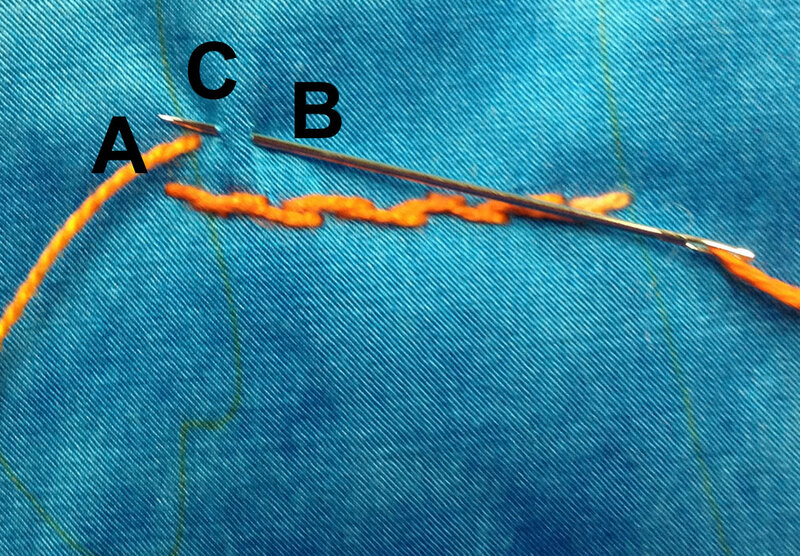 Place the thread going into D above the needle as you draw the thread through the fabric. 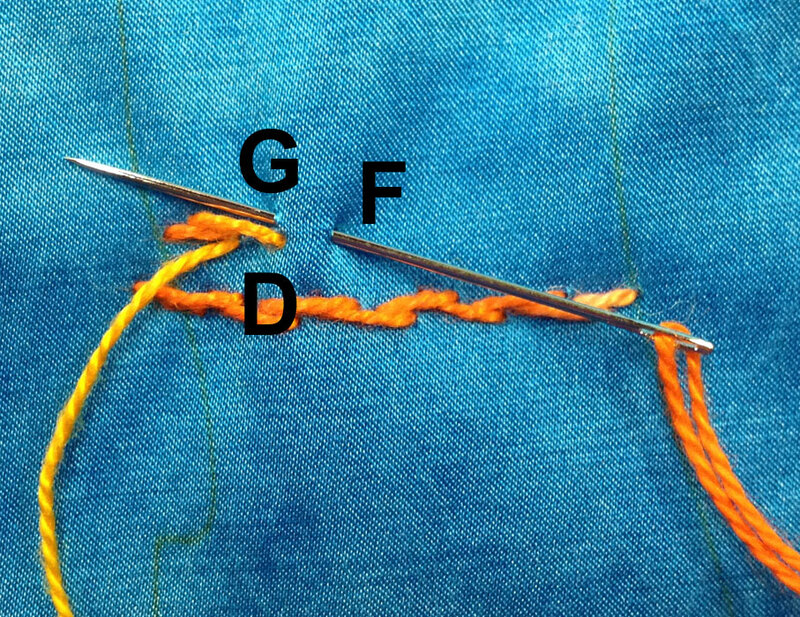 Insert the needle tip at point F about 1/8″ from D. Bring the needle tip up just above point D at point G. Point G is just above the stitch line. Place the thread below the needle as you draw the thread through the fabric. 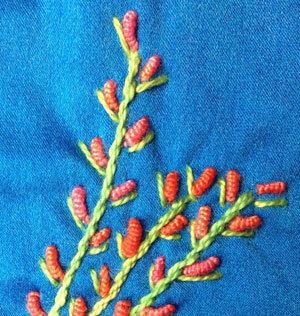 Continue down the stitch line alternating top and bottom stitches.